The keel for the lead ship of this class was laid on 27 December 1956, and was named to honor the location of the first flight made by the Wright brothers. "Kitty" was launched on 21 May 1960 and placed in commission on 29 April 1961. She was home-ported now in Yoosuka, Japan after arriving there on 11 August 1998 upon completion of a 12-month, $65 million overhaul in April 1998. The keel for the lead ship of this class was laid on 27 December 1956, and was named to honor the location of the first flight made by the Wright brothers. "Kitty" was launched on 21 May 1960 and placed in commission on 29 April 1961. She was home-ported now in Yoosuka, Japan after arriving there on 11 August 1998 upon completion of a 12-month, $65 million overhaul in April 1998. This is the famous "Don't Tread on Me" Patch. The keel for the lead ship of this class was laid on 27 December 1956, and was named to honor the location of the first flight made by the Wright brothers. "Kitty" was launched on 21 May 1960 and placed in commission on 29 April 1961. This is the 100 Night Traps patch (Night Centurion) for that ship and airwing. Named to honor the US Navy frigate built in 1797, the USS Constellation's keel was laid on 14 September 1957 and the carrier was launched on 8 October 1961. Most recently, "Connie" returned on 1 April 1997 from a WestPac, Indian Ocean, and Arabian Sea cruise with CVW-2. She is home-ported at NAS North Island, CA. The world's first nuclear-powered aircraft carrier and the eighth ship to carry this proud name, the Big 'E' was commissioned on 24 November 1961. She is home-ported at NAS Norfolk, VA and underwent a major overhaul in the early '90s, deployed with CVW-17 in 1996, completed a short overhaul in the summer of 1997, deployed again with CVW-3 in late 1998 to May 1999 to the Med and Arabian Sea regions during which time, they planned many contingency operations in support of the Kosovo crisis while in the Adriatic Sea, as well as participated in Operation Desert Fox while in the Persian Gulf. The world's first nuclear-powered aircraft carrier and the eighth ship to carry this proud name, the Big 'E' was commissioned on 24 November 1961. This is the 300 traps patch for having landed on her for 300 times. I only have 195 on her! The world's first nuclear-powered aircraft carrier and the eighth ship to carry this proud name, the Big 'E' was commissioned on 24 November 1961. This is the 100 night traps patch for having landed on her for 100 times in the dark! This patch does not have velcro attached. The USS AMerica was commissioned into service for the Atlantic Fleet in Jamuary 1965. She operated for many years in Mediterranean theaters, then 3 times to Southeast Asia. She was retrofitted to allow the Tomcat and became the first vessel to receive the Phalanx CIWS. She also participated in Operation Desert Storm before being retired in the mid-90s. This is the Centurion patch for the USS America. You had to have a total (day & nite) of 100 arrested landings (traps) to earn this patch. These are rare and hard to come by as they were only given to the aircrew that earned them, and usually only 1 was given. 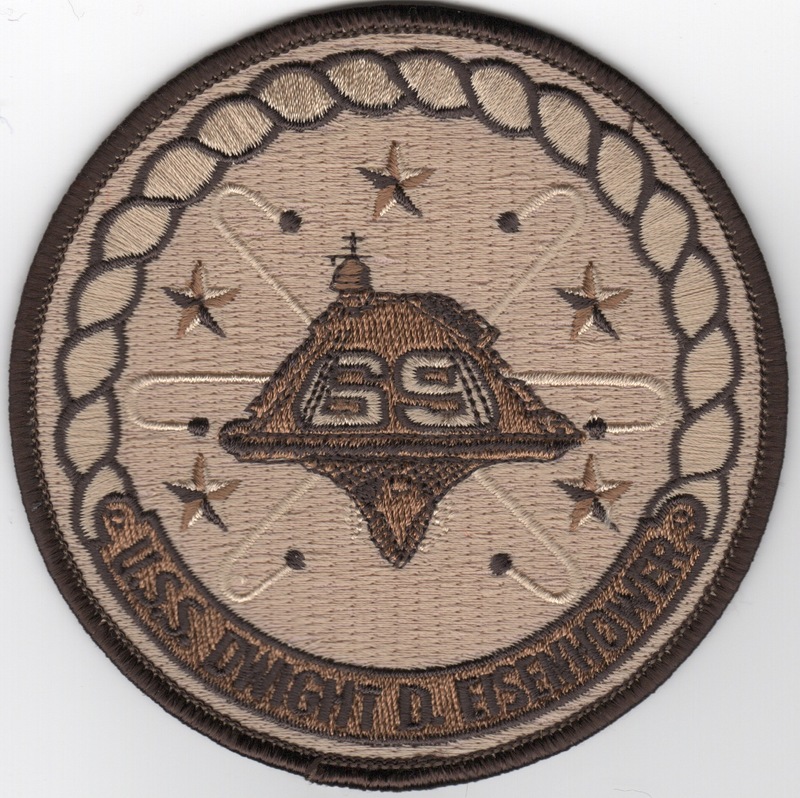 This is the Top Ten patch for the USS America. These were earned by the pilots of the airwing for their landing grades. If they were in the Top Ten in grades for each line period, they received this award. Named in honor of the 35th President, this carrier's keel was laid on 22 October 1964 and was launched on 27 May 1967. The was commissioned on 7 September 1968 and is currently home-ported at NAS Mayport, FL. Upon return from a 1997 Mediterranean/Arabic Gulf cruise with CVW-8, CVW-17 transferred to "Big John". This is the "repair shop" patch for the USS JFK (CV-67). The Aircraft Intermediate Maintenance Depot (AIMD) is the unit on the aircraft carrier that does middle-level maintenance repairs on aircraft. This type maintenance is that which cannot be conducted by the squadrons, but isn't serious enough that it has to be taken to the Depot on land. Completed in 1973, the USS Nimitz was not commissioned until 1975, when she began serving the Atlantic Fleet. She was named in honor of Fleet Admiral Chester W. Nimitz as the second nuclear aircraft carrier. In 1980, she made an around-the-world cruise, participated in the Teheran crisis, and launched the 2 Tomcats that shot down Libyan SU-22s. In 1987, the Nimitz transferred coasts and picked up CVW-9 from the Pacific Fleet. She joined the Enterprise as the largest warships in the world. She is currently being overhauled to the tune of $1.2 Billion that began in May 1998 and will take 33 months. Named in honor of America's 34th President and former General of the Army, her keel was laid on 15 August 1970, launched on 11 October 1975, and commissioned on 18 October 1977 at her home-port of NAS Norfolk, VA. Although deployed in 1998 with CVW-17 for a Med/Persian Gulf cruise, she returned 9 Dec 1998 and switched airwings to CVW-7. This is the color version of their patch. Named in honor of America's 34th President and former General of the Army, her keel was laid on 15 August 1970, launched on 11 October 1975, and commissioned on 18 October 1977 at her home-port of NAS Norfolk, VA. Although deployed in 1998 with CVW-17 for a Med/Persian Gulf cruise, she returned 9 Dec 1998 and switched airwings to CVW-7. This is the desert version of their patch. This is the centurion patch for the Ike. It denotes that you have landed on and taken off from the boat 100 times. Can usually get one of these in a typical cruise. 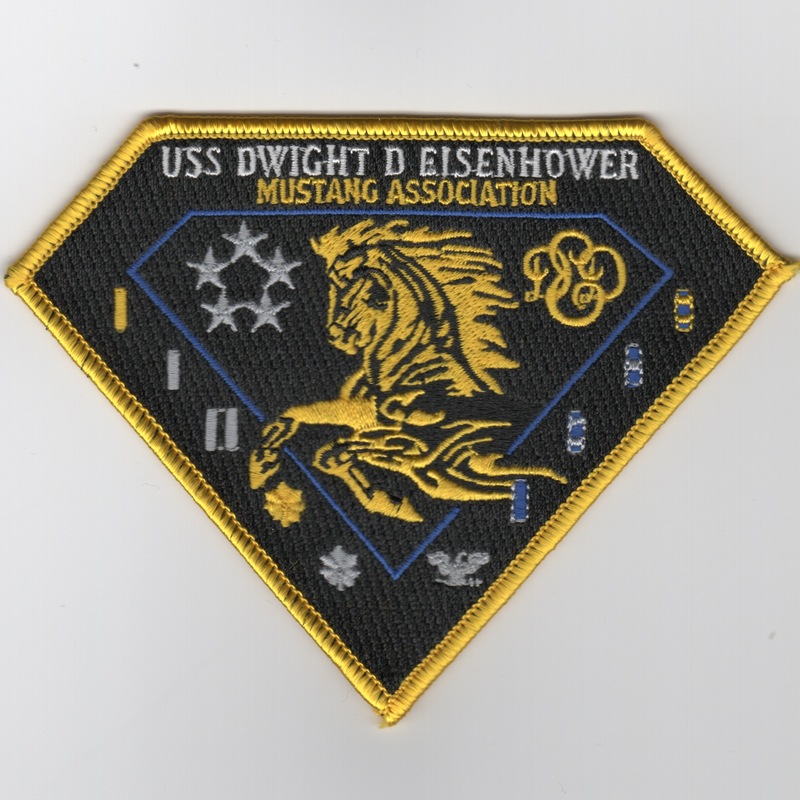 This is the 2006 award patch for the Ike. It includes the Ramage Award, Battle E, and the Battenberg Cup. It also says "Not just success, but Excellence" across the bottom.